We all know very well that the well-known Chinese flagship smartphone maker, of course, I am talking about none other than OnePlus is preparing a 5G smartphone. 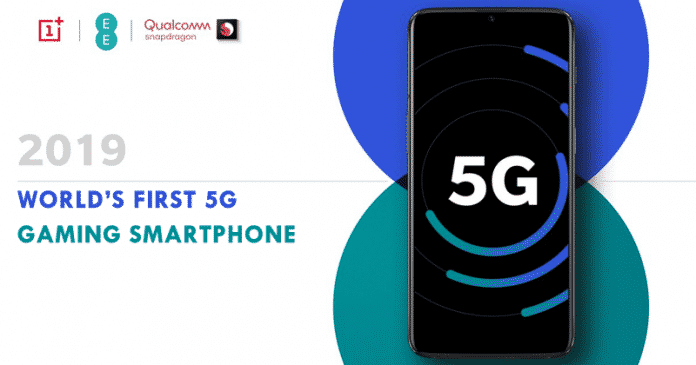 According to the latest reports, OnePlus will demonstrate the world’s first 5G gaming smartphone at the MWC 2019 fair and as we told that this smartphone would be mainly focused on gaming. It’s no secret that the well-known Chinese flagship smartphone maker, of course, I am talking about none other than OnePlus is preparing a 5G smartphone. And not only that as it will also be one of the first smartphone manufacturers to use the Qualcomm Snapdragon 855, compatible with next-generation mobile networks. As the company, of course, OnePlus now says that it will also demonstrate its new 5G smartphone at the MWC 2019 fair and the most exciting thing about this smartphone is that it will be mainly focused on gaming. Hence, the well-known Chinese smartphone manufacturer, of course, OnePlus advises that it will have space at the Qualcomm booth during the MWC 2019 in Barcelona. There, participants can also try out the 5G gaming features on the OnePlus 5G prototype, that OnePlus will present in MWC 2019. Moreover, it is possible that the highlight of this smartphone is for access to faster networks with less latency and, apart from all these things we should also thank the Snapdragon 855, as it will allow the OnePlus 5G prototype to have and show plenty of gaming performance. However, the CEO of the well-known flagship smartphone manufacturer, OnePlus, of course, Pete Lau said in an interview with a renowned media portal, The Verge that the 5G model will be between $200 and $300 more expensive than the traditional 4G model and the latest model, the OnePlus 6T, starts at $549. Apart from all these things the well-known Chinese smartphone manufacturer, OnePlus also confirmed that this device will not be the successor of OnePlus 6T, of course, OnePlus 7. As it will be a limited edition device from OnePlus with a focus on 5G and gaming. Basically, the idea is to have a reference design to help its engineers to design future devices compatible with this technology. While the well-known flagship maker OnePlus also said that it will be the first to launch a 5G smartphone in Europe. Moreover, the CEO of OnePlus, of course, Pete Lau stated that “We do not expect the 5G product to have huge sales, as it is still at an early stage, but the situation may be quite different by 2020”. But, the fact is that OnePlus is not alone in this race, as the well-known Chinese smartphone manufacturer Xiaomi is also working on 5G technology, and demonstrated a prototype of Mi Mix 3 with Snapdragon 855 last year. While the well-known Chinese smartphone manufacturer, Oppo also hosted a modified version of Find X in China that supports faster mobile networks. And the well-known South Korean giant LG will also present at the MWC fair a 5G smartphone with a liquid cooling system. So, what do you think about this? Simply share all your views and thoughts in the comment section below.